NFPA's Classroom Training (instructor led training) is an interactive learning experience delivered in real time by a hand-picked, expert instructor. Classes are offered in 20+ U.S. cities each year where you pick the locations and courses that work for you. See all classroom trainings. May 13-17. eight classes. Unlimited networking. April 29-May 3. Join us for NFPA safety training at the Marriott Century City. 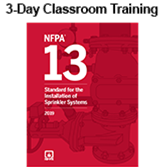 Advance your knowledge about 2019 NFPA 13 with interactive training. Then, earn your Certificate of Educational Achievement online! 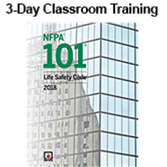 Take the 2018 Life Safety Code® Essentials Classroom Training to use the latest NFPA 101® strategies to protect building occupants.